The rise of the internet has been a complete game changer in regards to the new money making opportunities it has opened up. Millennials, in particular, are making money in ways that weren't possible just five or 10 years ago. Entire professions have sprung up that allow savvy entrepreneurs to cash in while actually working less than if they had a regular full-time job. There are plenty of articles out there claiming to show you how easy it is to make millions with very little work. I want to stress that generally this simply isn't the case, and there are no legitimate "get rich quick schemes" on the internet. All of these jobs, even the ones that will eventually provide you with passive income, take a lot of work and dedication to get right, especially at the start. However, with a bit of know-how and a lot of dedication, it's possible to break free from a life chained to your cubicle working 60 hours a week. Millennials have been at the forefront of the latest developments on the internet, and are continually inventing new ways to earn a living through it. 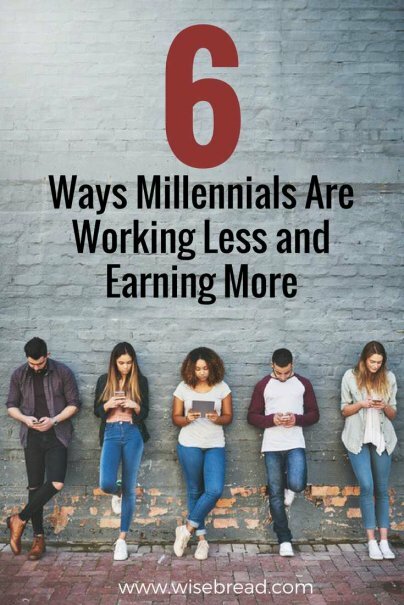 Here are six ways millennials are working less and earning more. Simon Yu, CEO of blockchain startup StormX told Forbes, "Millennials are particularly open to embracing new technology in order to create opportunities for themselves — and blockchain, the tech behind crypto, is no different. As masters of the side hustle and challengers of the traditional 9–5 working lives of previous generations, millennials are welcoming blockchain with open arms." Trading is probably the most well-known method of making money from cryptocurrency, but by no means the only one. Those with an in-depth knowledge of computers can actually mine cryptocurrency, although profits from this are far lower than they were previously. Buying and holding your chosen cryptocurrency is also a popular way to make profits. Rising values have sparked hundreds of stories about how early investors got rich by cashing out their holdings once their value had soared. Drop shipping allows people to create online stores and fulfill their orders without ever having to actually handle the inventory themselves. The orders are fulfilled either directly by the manufacturer, or another third party, freeing up the seller to concentrate solely on attracting new customers and selling products. There's no need for warehouses full of stock and you don't have to deal with postage and packaging, so you can set up and operate with extremely low operating costs. Once a store is set up and running, it can take minimal effort to keep it going. Sites like AliExpress have been specifically created for the purposes of connecting dropshippers with manufacturers, and they make the process even simpler because you don't need to source manufacturers yourself. This type of retail suits marketing- and sales-driven individuals who don't want to be bogged down by the manufacturing and delivery fulfillment aspect of running online stores. This trend has become particularly popular among millennials and Gen Z'ers because of internet marketing skills that have grown naturally over a lifetime of use, and it requires little in startup funds to get going. With a few minutes and a minimal amount of cash upfront, it's easy to set up your very own blog. Taking it to the next level and monetizing it will take longer, but it's possible to see a decent return on your investment within a matter of months. One of the most important steps is choosing a profitable niche, preferably one that you're already knowledgeable and passionate about so you can write about your subject with authority and enthusiasm right off the bat. Once you've built up an audience, there are lots of income streams open to bloggers. Savvy bloggers also create numerous blogs simultaneously to maximize income. Popular moneymaking methods include: recommending products or services to your audience and receiving payments for affiliate sales, advertising on your blog, and creating and selling your own products, like e-books and podcasts. Forget about renting space, filling it with products, and waiting around for customers to wander in. Online retail shops allow you to set up digitally with minimal upfront costs, and countless ways to actively drive paying customers to your store. Online stores have become big business, particularly with millennials and the rise of smartphones putting products in customers' hands 24/7. Helping companies unlock the potential of online advertising to increase their reach, and ultimately their profits, has gotten more popular in recent years. Since search engines and social media platforms turn to advertising as their main source of revenue, it has opened up endless possibilities. Facebook advertising, in particular, has become a popular way for people to make money through selling ad management services. It's possible to produce extremely targeted advertisements to a specific audience using the data they collect. Many businesses are completely unaware of how to use online advertising, and local companies potentially may not even have an online presence, making it relatively easy to sell to them. For a monthly retainer they receive guaranteed, quality customer referrals looking to purchase their services or products. Millennials are perfect for gigs like this, as they spend so much time on social media anyway, and have an intimate knowledge of what they and their peers connect to in terms of content.